This traditional pull-on baggy pant features a 2" elastic waistband with inside drawstring, four pockets including two at side seam, one at back hip and one side pocket with logo tag, and a 16" leg opening. Regular inseam: 34". This eight-button chef jacket features a stand-up collar, split sleeve pocket, one-piece back, and french cuffs. Center back length: 28". This executive chef coat features five-button closure, white contrast piping on collar and front, roll-up sleeves with snap tabs, moisture-wicking breathable mesh vent on back, one chest pocket, and split sleeve pocket. Center back length: 26". This traditional pull-on pant features a 2" elastic waistband with inside drawstring, three pockets including two in front and one at back hip, and a 18" leg opening. Regular inseam: 33". This executive chef coat features eight textured shank buttons, contrast piping around collar, front and on breast pocket, and split sleeve pocket. Center back length: 28". This pant features a flat front with one button, drawstring for ease of adjustment, functional zip fly, and two side cargo pockets. Regular inseam: 32". This v-neck top features a x-stitch at end, chest pocket pen slot, and side slits for easy access. Center back length: 27¼". The HH 360 Shawn Top features a snap front, henley neckline, one chest pocket, and decorative stitching detail. Center back length: 24¾". The HH 360 Steven Top features v-neck styling, three pockets, and decorative stitching detail. Center back length: 24⅞". This warm-up jacket features a double zipper front, two front pockets with cellphone pocket, waterproof hoodie with adjustable drawstring, and modern styling with reflective details. Center back length: 25½". This pant features a textured yoga waistband, detailed bottom hem that converts to a jogger style pant, six pockets total, and a secure cellphone pocket. Regular inseam: 31". Petite inseam: 28½". Tall inseam: 33". 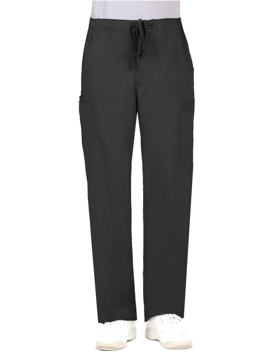 This pant features a yoga waistband for comfort, five pockets and a secure cellphone pocket, flat lock stitching details, and modern styling with reflective details. Regular inseam: 31". Petite inseam: 28½". Tall inseam: 33". This long sleeve performance layering tee features hidden thumb loops, odor resistant and moisture-wicking fabric. Center back length: 25". This stylish v-neck top features two besom pockets with secure cellphone pocket, flat lock stitching details, and texture details on the side panels and shoulders. Center back length: 24½". 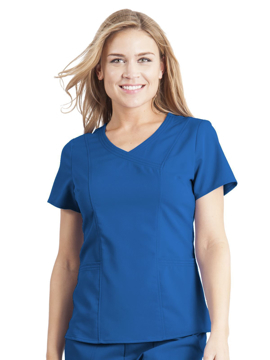 This stylish y-neck top features reflective trim detail and zipper at neck, two patch pockets, a pen pocket, secure cellphone pocket, and decorative stitching details. Center back length: 24½". This warm-up snap-front jacket features round neck collar and rib knit cuffs on sleeves. Center back length: 26". 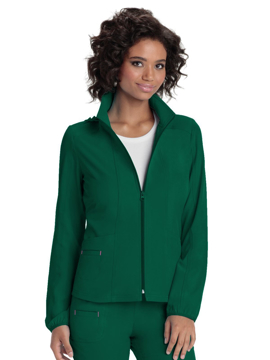 This warm-up jacket features a mandarin collar with zipper front, triple-needle stitching details and two side pockets. Center back length: 25¼". 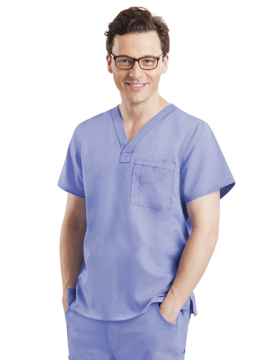 This notched collar lab coat features two patch pockets, inside pocket, pen pocket and cellphone pocket. Center back length: 31". This notched collar lab coat features a four-button closure, front darts, sleeve slits on cuffs, side slits, back yoke, back princess seams, adjustable back tabs with button closures, three regular pockets, two front patch pockets with twill tape trim, and one inner pocket. Center back length: 27½". This y-neck top features triple-needle stitching details, and two patch pockets. Center back length: 24". This v-neck top features a ribbon trim with overall embossed solid pattern, two patch pockets, and hidden cellphone pocket. Center back length: 25½". This v-neck top features triple-needle stitching details, and two pockets. Center back length: 25". This mock cross over top features triple-needle stitching details, seam for superior fit, and two patch pockets. Center back length: 24½". Modern long sleeve layering tee that gives soft stretch comfort throughout the day. Center back length: 24½". 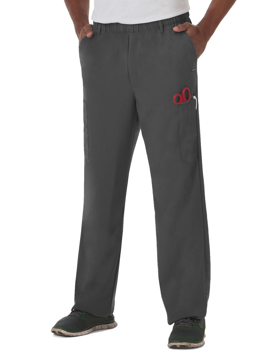 This straight leg pant features and elastic waistband and drawstring, and hidden zipper pocket. Regular inseam: 31". Petite inseam: 28½". Tall inseam: 32½". 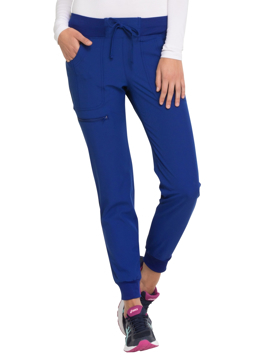 This pant features a flat front grommet detail on drawstring, two front pockets, and back yoke elastic detail. Regular inseam: 31". Petite inseam: 28½". Tall inseam: 33". This pant features a yoga-inspired waistband with stitching details for style and five pockets for storage. Regular inseam: 30½". Petite inseam: 28½". Tall inseam: 32½". This v-neck top features breathable mesh shoulder panels, reflective tape on back, sporty v-neckline, and chest pocket. Center back length: 28". This pant featurse an adjustable waistband with full elastic and inside drawstring, a fully functional zipper fly, five belt loops, two front slash pockets, right cargo pocket that features an inside cellphone pocket, left divided cargo pocket for pens and instruments, two secure back-zippered welt pockets, and a 19" leg opening. Regular inseam: 31". Tall inseam: 33½". This warm-up jacket features an athletic-inspired collar and sleeve, full zipper closure with earbud holder zipper pull, and two zipper closure pockets. Center back length: 28". 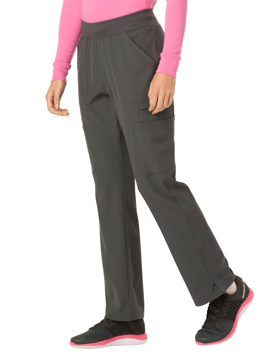 This unisex pant features a full drawstring tie-waist, back elastic, slimmer silhouette, deep cargo pocket, back hip pocket with velcro closure, and a 19" leg opening. Regular inseam: 31". Petite inseam: 28". Tall inseam: 33". This v-neck top features a zipper pocket that safely stores valuables and a cellphone, side seam hem venting for easy all-day movement, and three pockets. Center back length: 27". This banded v-neck top features forward dropped shoulder with badge loop, four pockets, and side vents. Center back length: 28". This athletic inspired warm-up jacket features a stand-up collar, snap front closure, two angled patch pockets, and soft-stretch color-matched knit cuffs. Center back length: 28". This pant features a half elastic back, half drawstring front, two angled pockets plus cargo with additional zipper pocket, slight flare, side vents, a 19" leg opening, and four pockets. Regular inseam: 31½". Petite inseam: 29½". Tall inseam: 33½".